Apocalypse World provides some of the best statements I know of regarding several aspects of play that I find particularly rewarding. However, Apocalypse World also has a reputation, especially around the dives I frequent, of prioritizing dramatic development and focusing on shared narrative authority rather than facilitating fictional challenges. While some of these assumptions have a grain of truth, the bulk of the text is, in my opinion, tremendously useful for OSR games, or at least the kinds of games I run, whatever you want to call them. 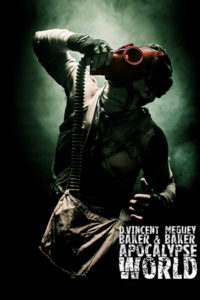 So I plan to write a handful of posts highlighting some of the acumen I see in Apocalypse World. 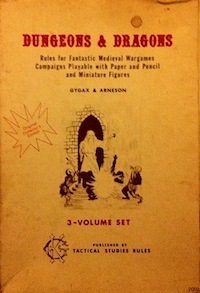 Though Apocalypse World the text is for the referee (the subtitle is The Master of Ceremonies, which is the game’s term for referee), the order of chapters seems focused on players, perhaps in an attempt to build interest by sketching an evocative setting, barfing forth apocalyptica in the game’s own lingo. This ordering does the text no favors, because it buries the bulk of insight regarding running games under reams of character class descriptions and powers, the playbooks. So I will be reading the text here in my preferred order, beginning with the Master of Ceremonies chapter. My interest in running a game where I do everything Apocalypse World directs and nothing else is relatively low. As with all game paraphernalia, I am looking for what I can use rather than a complete, perfect edifice. I treat all game products as tools rather than gospel. Apocalypse World has two editions: 1st (2010) and 2nd (2016). For my purposes, the differences between the editions are minor, though the second edition’s physical book is nicer. The most notable difference is that 2E replaces fronts with threat maps, which serve a similar purpose but take a slightly different approach. I will be reading the second edition. If you are curious, I would also read Vincent’s post about concentric game design, by which he means that Apocalypse World is designed to degrade gracefully as you progressively ignore the rules that are less fundamental. Finally, I want to provide a shoutout to Jason D’Angelo’s long series of posts on Google Plus, The Daily Apocalypse, in which he undertakes a close read of Apocalypse World. This volume of commentary would probably be overwhelming for someone with only casual interest, but I find it useful so there you go. This entry was posted in Speculations and tagged Apocalypse World on August 12, 2018 by Necropraxis. Just curious- have you played AW or other PbtA games? Yeah I have played Apocalypse World itself and Dungeon World, the second slightly more extensively. Basically, the stuff the players invent should be the things that their characters would already know, details of the world and their personal backgrounds. “You have someone you’re trying to avoid in this settlement, who is it?” The kind of stuff that people might write in their character backgrounds in traditional games. Exactly! Somewhere the idea of overt collaboration crept too far into the public awareness, but that’s not part of the game as written. Asking questions and using the answers is not different than traditional adventure games. I do think it is a relatively small part of the game as written, mostly limited to the ask provocative questions and build on the answers principle. I agree with you, though, that the text does seem to mostly restrict contributions to what would be the direct experience of the player characters and then only indirectly work out implications for the wider fictional world. I will probably discuss this a bit more once I get to the principles. This sort of thing is not core to what I will be focusing on, but it is definitely a part of Apocalypse World. The major difference in this example and a typical shop visit is one of permission – an AW MC has permission to put you places, while a D&D DM usually asks. What PbtA game do you think has the “best” set of GM Principles/Moves? I put “best” in quotes because I’d also like you to define what it means? Does best mean most on-brand for the genre, most generic, most well-explained? Best for me means most useful in thinking about running and playing D&D.